The King reviews the newly expanded Chevalier Garde, of the Garde du Corps. Scene: the throne room. Count Herman of Munster has returned from the Duchy of Fenwick and is in discussion with King Leopold IV. King: A successful visit to Fenwick then dear Count ? Count: Yes your majesty. 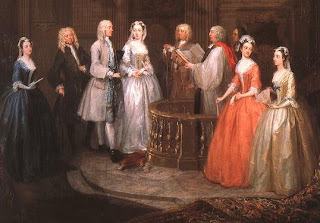 your sister Alice and Duke Maurice are now married - I attended the ceremony before I left. Your sister really loved that Meissen tea service you sent for a present. The happy couple are off for a tour round Fenwick, then they will be visiting us here. King: I would love to see the look on King Francis of Monrovia's face when he hears the news. Count: I bet he will have another temper tantrum. King: So we've stopped Monrovia from getting round our northern flank. Count: Yes, even if Monrovia tried it they'd have to reduce the border forts and then face the Fenwick army; giving us plenty of time to come to their aid. King: Did you here the news from Tippelbruder? Count:Yes, it reached me while I was in Fenwick. Duke Maurice was pleased we'd been involved in defeating the Stagonian punishment force. For Wittenberg I rebased the Garrison troops (IM), and gave them sone artillery(IM). The brigands (Front Rank + some IM) have been combined to make a militia company. Scenarios for the use of these figs is border skirmishes and small actions in the south of Upper-Belgravia (the disputed province) where it borders Saxe-Jarlsberg. Maurice, Duke of Fenwick married Princess Alice the youngest sister of King Leopold IV of Wittenberg in a secret wedding cermony held in the Ducal palace. Maurice, met Princess Alice at a ball at the court of Wittenberg while visiting - some say it was love at first sight. The marriage seals a treaty of alliance and co-operation between the Duchy of Fenwick and the Kingdom of Wittenberg. The marriage was announced the next evening at a sumptuous costume ball, to which all the visiting ambassadors were invited. The announcement caused great excitement and celebration at the ducal court, some ambassadors were seen discussing the impact this would have on the balance of power in the region. Apparently there was great secrecy about the wedding and the alliance. 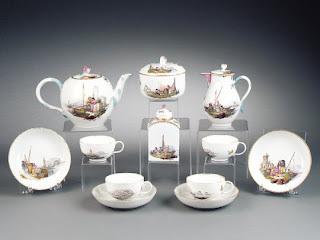 Princess Alice had travelled incognito to Fenwick in a black coach; there had been much interest in this and the contents of a large chest secured to the coach roof - the chest contained a specially commisioned Meissen tea service which was a wedding present from the King of Wittenberg. The Monrovian Dragoon regiments shown drilling on foot; near the army muster camp. Scenario: Two bands of brigands have been reported operating out of the area of Ottenheim; it is thought that one of the groups of brigands has it's hideout near a woodsman's cottage. There are rumours that some of the brigands may be Monrovians in disguise. The commander of the local garrison has been ordered to take some troops to flush out and eradicate the brigands - recover any stolen goods and if possible to capture some brigands for questioning. Believing there is only one group of brigands to search out, the officer in command moves on ahead across the river, leaving the jagers to follow on behind. We had great fun with this; the rules were loosely based on some FIW skirmish rules I found online. Result possibly as expected - regulars trying to fight in wooded area are likely to have difficulties - the jager detachment should really have been bigger this would have given them more chance in a firefight.